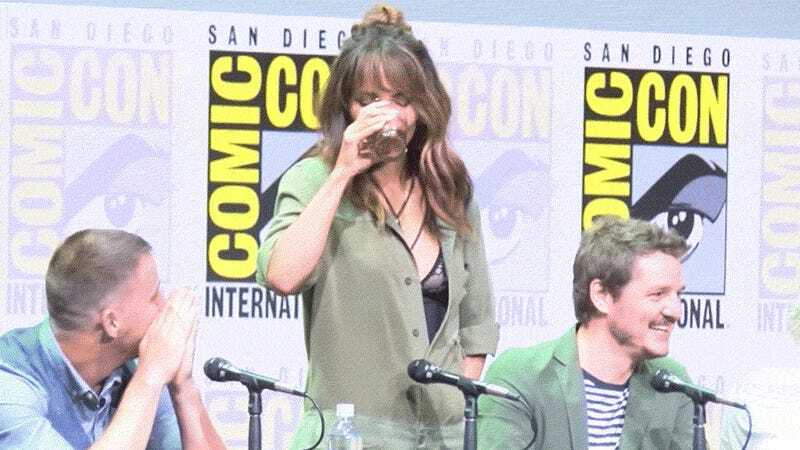 Oscar-winning actress and Instagram star Halle Berry is all over celebrity news Friday due to footage of her purportedly chugging whiskey onstage at Comic-Con this week. Despite the media’s willingness to believe a group of people whose job is to pretend as they attempt to create buzz for a summer blockbuster, I and several of my colleagues questioned Berry’s attention-getting stunt. So many people care about this chug. 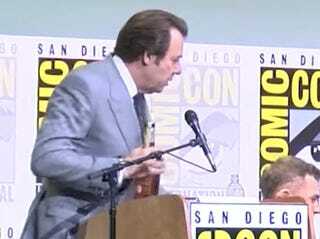 In videos and photos of the incident, which took place during the panel for Kingsman: The Golden Circle (please don’t make me write about Kingsman: The Golden Circle), moderator Jonathan Ross pulls out a bottle of Old Forester whiskey and offers some to the cast—including Colin Firth, Channing Tatum, Jeff Bridges, and Berry. While passing out glassware, Ross realizes they have enough shot glasses for all but one actor, so Berry draws the short stick—which, in this case, is a full-sized pint glass. A few minutes later, she stands and chugs the whole dang thing as everyone in the audience cheers her on. But do we think she actually chugged over half a pint (roughly 6 shots) of whiskey in under 10 seconds, or do we think the actors were drinking iced tea like I did in my high school production of The Glass Menagerie? Let’s examine the evidence. Drinking that much whiskey that quickly could potentially raise a person’s BAC to .25, which is enough to cause someone to lose consciousness. There’s a cork in the bottle, but whether or not it was sealed before the stunt was pulled is impossible to tell from the available footage. I want receipts, aka a closeup of an unbroken manufacturer’s seal. “I wish it was real,” Pedro Pascal says when the “whiskey” is revealed. Why? Because he is an actor. And actors drink fake alcohol onscreen all the time. Though Jeff Bridges reassures him that it is, I’m still not buying it. Are you?